Before taking a photograph, you need to make sure that your subject is in focus. When it is, all the rays of light that leave a point on the subject are bent by the lens, so that they hit the correct place on the film. This makes a clear, sharp image. Parts of the scene inside or behind the subject may not be in focus. On some cameras, you have to choose the part of the sence that you want to be in focus. Autofocus cameras focus the lens by automatically choosing the object at the center of the image to be taken. 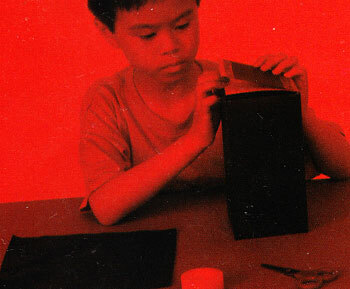 This experiment involves making a simple camera with just a few basic pieces of equipment . it uses photographic paper (paper with a light- sensitive coating on one side) instead of flim, and a pinhole instead of a lens. When the paper is processed, you will have a negative. The next project, “ Easy prints”, shows you how to develop it. 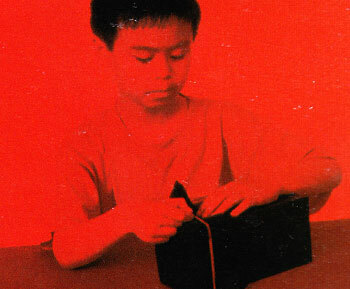 Pinhole box viewer, aluminum foil, scissors, tape, pencil, black paper, thin card, rular, heavy light-proof cloth or plastic sheet, photographic paper, rubber band. 1. 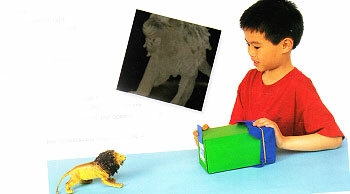 Make the pinhole viewer from the “ Make your own viewr” project, but remove the tracing-paper screen. Replace the one and half card square with aluminum foil. 2. Pierce a hole , about 1/16 in across, in the midlle of the foil using a sharp pencil. Open the back of the box. 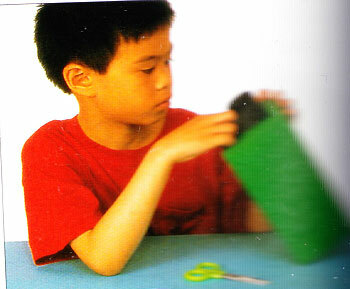 Roll up some black paper, and fit it through the large hole to line the inside. 3. Cut a square of card large enough to cover the aluminum foil. Tape just the top edge of the square od acrd to the box, so that itwill act as a shutter. 4. 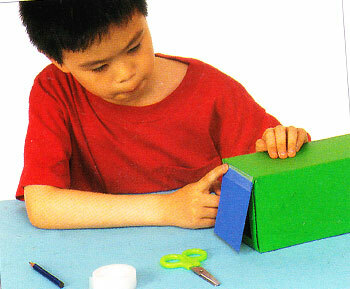 Measure and cut a square of card to fit across the other end of the box. 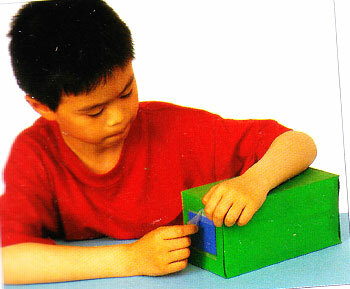 Tape it to one edge, so that it closes over the hole like a door or flap. 5. Lay the heavy,light-proof plastic sheet on the working surface. 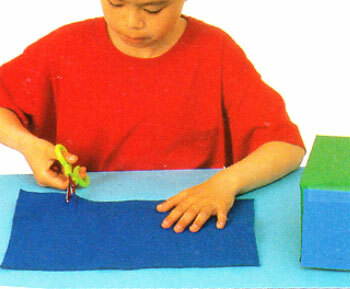 Cut a piece of the cloth or sheet large enough to fold around the end of the box. 6. In a completely dark room, and feling with your fingers, put a piece of the photographic paper underneath the flap at the end of the box. 7. Close the flap , then, still feeling with your fingers, wrapthe cloth or plastic sheet tightly over it. 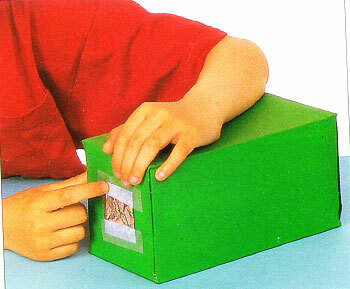 Next , put a rubber band tightly around the box to secure it. 8. Now you can turn the light on. Point the camera at a well-lit object and open the shutter. Leave the camera perfectly still for about five minutes, and close the shutter.